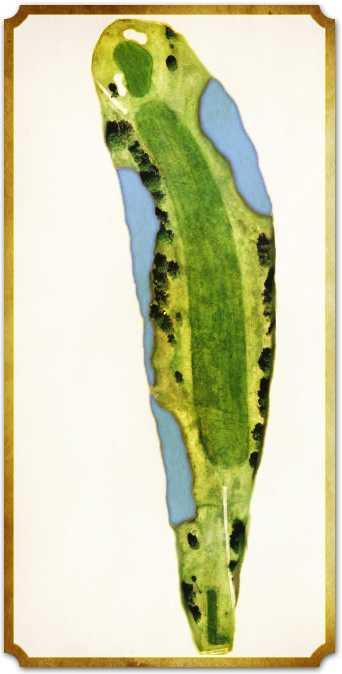 Things get a little tougher with this gentle dogleg left par 4. While members have learned the hard way to play up the right side from the tree, visitors often try to bite a little off the corner, usually with disastrous results. A shot missed left into the dense pines or water hazard will cost you at least one shot, and sometime two. Mounding on the left side of the fairway normally kicks a ball left, so the small hill on the right side makes for a good target. Another deep and gently undulating green awaits a middle iron approach, which should be played squarely towards the middle of the green to avoid Ross style false sides. Par is a good score here.